Transparent Data Encryption (TDE) with Azure Key Vault integration allows to encrypt the Database Encryption Key (DEK) with a customer-managed asymmetric key called TDE Protector. This is also generally referred to as Bring Your Own Key (BYOK) support for Transparent Data Encryption. In the BYOK scenario, the TDE Protector is stored in a customer-owned and managed Azure Key Vault, Azure’s cloud-based external key management system. The TDE Protector can be generated by the key vault or transferred to the key vault from an on premises HSM device. The TDE DEK, which is stored on the boot page of a database, is encrypted and decrypted by the TDE Protector stored in Azure Key Vault, which it never leaves. SQL Database needs to be granted permissions to the customer-owned key vault to decrypt and encrypt the DEK. If permissions of the logical SQL server to the key vault are revoked, a database will be inaccessible and all data is encrypted. For Azure SQL Database, the TDE protector is set at the logical SQL server level and is inherited by all databases associated with that server. For Azure SQL Managed Instance, the TDE protector is set at the instance level and it is inherited by all encrypted databases on that instance. The term server refers both to server and instance throughout this document, unless stated differently. Transparent Data Encryption with Azure Key Vault integration (Bring Your Own Key) for Azure SQL Database Managed Instance is in preview. With TDE with Azure Key Vault integration, users can control key management tasks including key rotations, key vault permissions, key backups, and enable auditing/reporting on all TDE protectors using Azure Key Vault functionality. Key Vault provides central key management, leverages tightly monitored hardware security modules (HSMs), and enables separation of duties between management of keys and data to help meet compliance with security policies. Greater trust from your own clients, since Key Vault is designed so that Microsoft does not see or extract any encryption keys. For those using service-managed TDE who would like to start using Key Vault, TDE remains enabled during the process of switching over to a TDE protector in Key Vault. There is no downtime nor re-encryption of the database files. Switching from a service-managed key to a Key Vault key only requires re-encryption of the database encryption key (DEK), which is a fast and online operation. When TDE is first configured to use a TDE protector from Key Vault, the server sends the DEK of each TDE-enabled database to Key Vault for a wrap key request. Key Vault returns the encrypted database encryption key, which is stored in the user database. It is important to note that once a TDE Protector is stored in Azure Key Vault, it never leaves the Azure Key Vault. The server can only send key operation requests to the TDE protector key material within Key Vault, and never accesses or caches the TDE protector. The Key Vault administrator has the right to revoke Key Vault permissions of the server at any point, in which case all connections to the server are cut off. Ensure Azure Key Vault and Azure SQL Database/Managed Instance are going to be in the same tenant. Cross-tenant key vault and server interactions are not supported. When configuring TDE with Azure Key Vault, it is important to consider the load placed on the key vault by repeated wrap/unwrap operations. For example, since all databases associated with a SQL Database server use the same TDE protector, a failover of that server will trigger as many key operations against the vault as there are databases in the server. Based on our experience and documented key vault service limits, we recommend associating at most 500 Standard / General Purpose or 200 Premium / Business Critical databases with one Azure Key Vault in a single subscription to ensure consistently high availability when accessing the TDE protector in the vault. Recommended: Keep a copy of the TDE protector on premises. This requires an HSM device to create a TDE Protector locally and a key escrow system to store a local copy of the TDE Protector. Learn how to transfer a key from a local HSM to Azure Key Vault. Soft deleted resources are retained for a set period of time, 90 days unless they are recovered or purged. 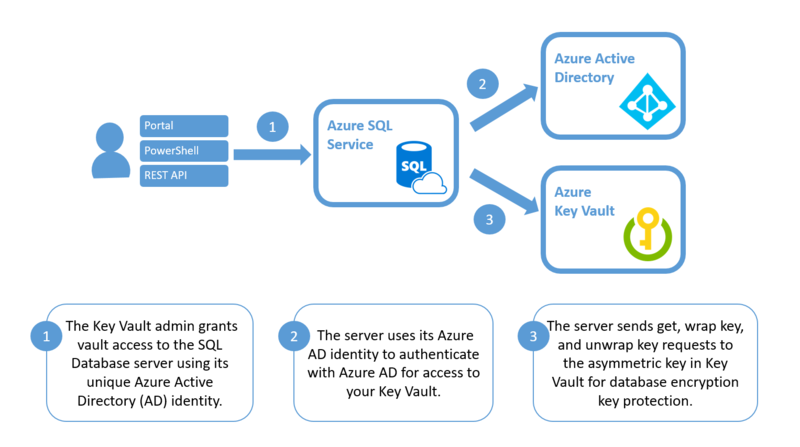 Grant the SQL Database server access to the key vault using its Azure Active Directory (Azure AD) Identity. When using the Portal UI, the Azure AD identity gets automatically created and the key vault access permissions are granted to the server. Using PowerShell to configure TDE with BYOK, the Azure AD identity must be created and completion should be verified. See Configure TDE with BYOK and Configure TDE with BYOK for Managed Instance for detailed step-by-step instructions when using PowerShell. If the Azure AD Identity is accidentally deleted or the server’s permissions are revoked using the key vault’s access policy, the server loses access to the key vault, and TDE encrypted databases are inaccessible within 24 hours. If TDE encrypted SQL databases lose access to the key vault because they cannot bypass the firewall, the databases are inaccessible within 24 hours. Enable auditing and reporting on all encryption keys: Key Vault provides logs that are easy to inject into other security information and event management (SIEM) tools. Operations Management Suite (OMS) Azure Monitor logs is one example of a service that is already integrated. To ensure high-availability of encrypted databases, configure each SQL Database server with two Azure Key Vaults that reside in different regions. Create your encryption key locally on a local HSM device. Ensure this is an asymmetric, RSA 2048 key so it is storable in Azure Key Vault. For testing purposes, it is possible to create a key with Azure Key Vault, however this key cannot be escrowed, because the private key can never leave the key vault. Always back up and escrow keys used to encrypt production data, as the loss of the key (accidental deletion in key vault, expiration etc.) results in permanent data loss. Use a key without an expiration date – and don't set an expiration date on a key already in use: once the key expires, the encrypted databases lose access to their TDE Protector and are inaccessible within 24 hours. Create an Azure Key Vault key backup before using the key in Azure Key Vault for the first time. Learn more about the Backup-AzKeyVaultKey command. Keep previous versions of the key in the key vault when rotating keys, so older database backups can be restored. When the TDE Protector is changed for a database, old backups of the database are not updated to use the latest TDE Protector. Each backup needs the TDE Protector it was created with at restore time. Key rotations can be performed following the instructions at Rotate the Transparent Data Encryption Protector Using PowerShell. Keep all previously used keys in Azure Key Vault after changing back to service-managed keys. This ensures database backups can be restored with the TDE protectors stored in Azure Key Vault. TDE protectors created with Azure Key Vault have to be maintained until all stored backups have been created with service-managed keys. Make recoverable backup copies of these keys using Backup-AzKeyVaultKey. How to configure high availability with Azure Key Vault depends on the configuration of your database and SQL Database server, and here are the recommended configurations for two distinct cases. The first case is a stand-alone database or SQL Database server with no configured geo redundancy. The second case is a database or SQL Database server configured with failover groups or geo-redundancy, where it must be ensured that each geo-redundant copy has a local Azure Key Vault within the failover group to ensure geo-failovers work. In the first case, if you require high availability of a database and SQL Database server with no configured geo-redundancy, it is highly recommended to configure the server to use two different key vaults in two different regions with the same key material. This can be accomplished by creating a TDE protector using the primary Key Vault co-located in the same region as the SQL Database server and cloning the key into a key vault in a different Azure region, so that the server has access to a second key vault should the primary key vault experience an outage while the database is up and running. Use the Backup-AzKeyVaultKey cmdlet to retrieve the key in encrypted format from the primary key vault and then use the Restore-AzKeyVaultKey cmdlet and specify a key vault in the second region. 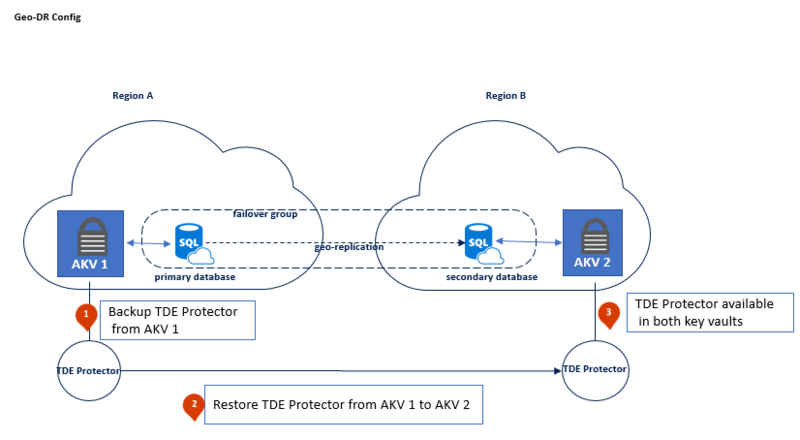 To maintain high availability of TDE Protectors for encrypted databases, it is required to configure redundant Azure Key Vaults based on the existing or desired SQL Database failover groups or active geo-replication instances. Each geo-replicated server requires a separate key vault, that must be co-located with the server in the same Azure region. Should a primary database become inaccessible due to an outage in one region and a failover is triggered, the secondary database is able to take over using the secondary key vault. The following section will go over the setup and configuration steps in more detail. Create two Azure Key Vaults in two different regions using PowerShell to enable the “soft-delete” property on the key vaults (this option is not available from the AKV Portal yet – but required by SQL). Both Azure Key Vaults must be located in the two regions available in the same Azure Geo in order for backup and restore of keys to work. If you need the two key vaults to be located in different geos to meet SQL Geo-DR requirements, follow the BYOK Process that allows keys to be imported from an on-premises HSM. Back up the primary key and restore the key to the second key vault. See BackupAzureKeyVaultKey and Restore-AzKeyVaultKey. The following configuration steps differ whether starting with a new SQL deployment or if working with an already existing SQL Geo-DR deployment. 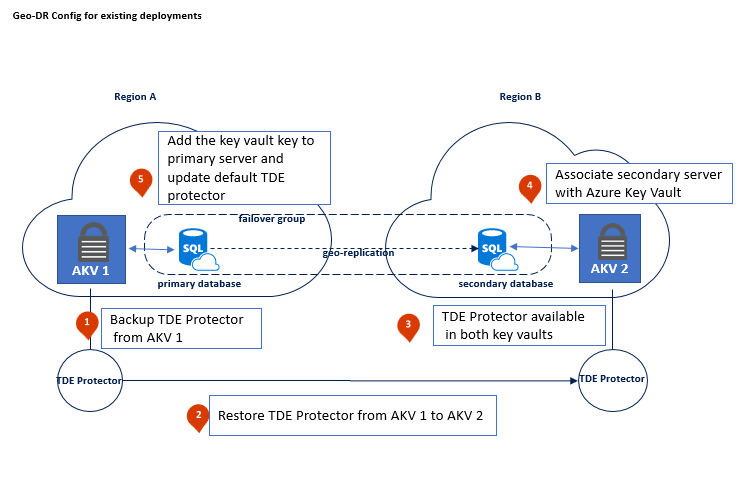 We outline the configuration steps for a new deployment first, and then explain how to assign TDE Protectors stored in Azure Key Vault to an existing deployment that already has a Geo-DR link established. Create the two SQL Database servers in the same two regions as the previously created key vaults. Select the key to use as TDE Protector – each server will use the local copy of the TDE Protector. Doing this in the Portal will create an AppID for the SQL Database server, which is used to assign the SQL Database server permissions to access the key vault – do not delete this identity. Access can be revoked by removing the permissions in Azure Key Vault instead for the SQL Database server, which is used to assign the SQL Database server permissions to access the key vault. Follow the active geo-replication guidance to complete the scenario, this step will create the secondary database. It is important to ensure that the same TDE Protectors are present in both key vaults, before proceeding to establish the geo-link between the databases. When assigning the key vault to the server, it is important to start with the secondary server. In the second step assign the key vault to the primary server and update the TDE Protector, the Geo-DR link will continue to work because at this point the TDE Protector used by the replicated database is available to both servers. 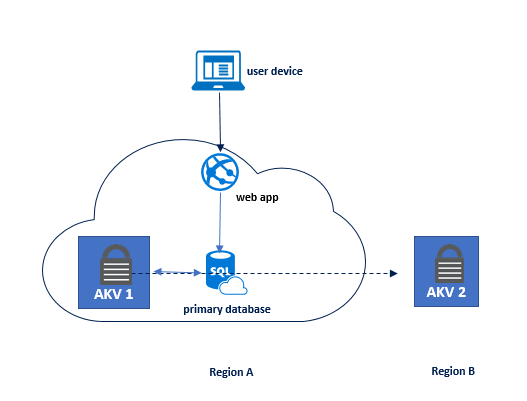 Before enabling TDE with customer managed keys in Azure Key Vault for a SQL Database Geo-DR scenario, it is important to create and maintain two Azure Key Vaults with identical contents in the same regions that will be used for SQL Database geo-replication. “Identical contents” specifically means that both key vaults must contain copies of the same TDE Protector(s) so that both servers have access to the TDE Protectors use by all databases. Going forward, it is required to keep both key vaults in sync, which means they must contain the same copies of TDE Protectors after key rotation, maintain old versions of keys used for log files or backups, TDE Protectors must maintain the same key properties and the key vaults must maintain the same access permissions for SQL. Follow the steps in Active geo-replication overview to test and trigger a failover, which should be done on a regular basis to confirm the access permissions for SQL to both key vaults have been maintained. Once a database is encrypted with TDE using a key from Key Vault, any generated backups are also encrypted with the same TDE Protector. To restore a backup encrypted with a TDE Protector from Key Vault, make sure that the key material is still in the original vault under the original key name. When the TDE Protector is changed for a database, old backups of the database are not updated to use the latest TDE Protector. Therefore, we recommend that you keep all old versions of the TDE Protector in Key Vault, so database backups can be restored. If a key that might be needed for restoring a backup is no longer in its original key vault, the following error message is returned: "Target server <Servername> does not have access to all AKV Uris created between <Timestamp #1> and <Timestamp #2>. Please retry operation after restoring all AKV Uris." To mitigate this, run the Get-AzSqlServerKeyVaultKey cmdlet to return the list of keys from Key Vault that were added to the server (unless they were deleted by a user). To ensure all backups can be restored, make sure the target server for the backup has access to all of these keys. To learn more about backup recovery for SQL Database, see Recover an Azure SQL database. To learn more about backup recovery for SQL Data Warehouse, see Recover an Azure SQL Data Warehouse. Additional consideration for backed up log files: Backed up log files remain encrypted with the original TDE Encryptor, even if the TDE Protector was rotated and the database is now using a new TDE Protector. At restore time, both keys will be needed to restore the database. If the log file is using a TDE Protector stored in Azure Key Vault, this key will be needed at restore time, even if the database has been changed to use service-managed TDE in the meantime.